Potatoes have only been around in Europe for about 500 years, but are definitely a staple in Russian cooking. They originated from South America where they have been cultivating it for thousands of years. There is something satisfying about eating a rustic meal of potatoes, maybe it’s all the carbs. I remember my mum making Russian Pan Fried Potatoes and Onion as a kid, and the smell of frying onions wafting through the air. I even remember the old, deep style frying pan she used. It takes a bit longer to fry the potato if you want to have crispy fried pieces, but it’s worth it. Can you Pan Fry Potatoes without boiling? My answer to this question is always YES. I suppose the difference is the thickness of the potatoes. If boiling the potatoes before frying, then they need to be thicker, chunkier potatoes, which is not what this recipe calls for. Thinly sliced potatoes is what you need when making this recipe. This allows them to crispy up as you cook them, don’t waste your time boiling potatoes. These aren’t German potatoes or breakfast hash browns, but a simple Russian pan fried potatoes. As I said, Pan Fried Potatoes require thinly sliced potatoes, sliced by hand. Using a mandolin slicer would make the potatoes too thin, paper thin in fact. They would fall apart if they are too thinly sliced. I keep the potato slices between ⅛”- ¼” thick. I cut the potato in half, lay it flat and slice away. I usually use Olive Oil when frying potatoes, and allow them to crisp up a bit when frying. Use a flipper to carefully flip to keep the potatoes intact. Don’t need to stir them too constantly. Thinly slice the onion and add them to the potatoes when they start to crisp up. Usually this is at the 12-15 minute mark. You don’t want the onions too crispy, if added too early. Added too late and they will be crunchy and raw. I am making it sound harder than it is, it’s really hard to screw this up, just fry the onions with the potatoes! We used to drown our potato in ketchup, which is what I suppose most kids do. Sometimes mum would make this as a side with our dinner. Other times, it was made along with fried eggs for breakfast (much tastier than hash browns). You can even fry bacon, then use the bacon fat to cook the potatoes, before adding back the bacon before serving. 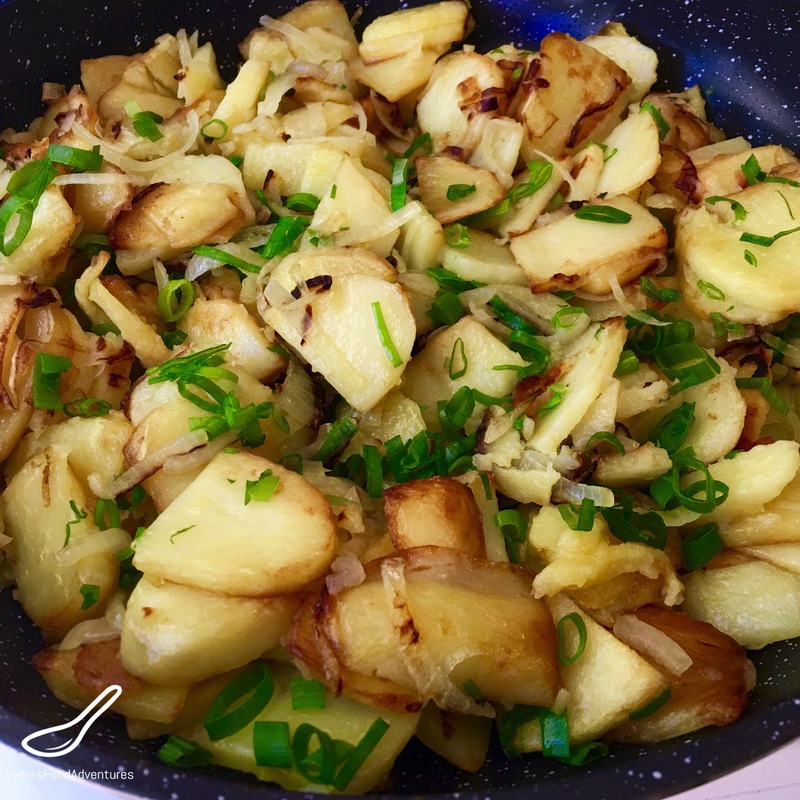 Russian Pan Fried Potatoes and Onions is a simple, rustic dish, that takes me back to my childhood. The crispy potato bits are my favourite! Plus it’s Gluten Free and Vegan, if that’s important to your diet. Bon Appetit! Приятного аппетита! Peel and thinly slice the potatoes about ⅛"-¼" thick. Heat the oil in a seasoned fry pan or non-stick pan. Carefully add the potatoes into the hot oil. Keep uncovered. Fry potatoes until crispy about 20-25 minutes. Do not rapidly stir potatoes, but carefully flip them, try to keep them intact, and not mushy. Just before the potatoes are starting to crisp up, add the sliced onions to the potatoes and continue to cook for the final 5 minutes. Add salt and pepper and a garnish of green onions carefully as you try to mix the seasoning together, but keep potatoes as intact as you can. Garnish with green onions, serve with ketchup and enjoy! I know, right? Delicious! ???????? So much better than mashed potatoes, isn’t it? Looks awesome! Like the fresh spring onions to give it some colour! This is my husband favorite! You are absolutely right! Tastes so much better than hash browns for sure.